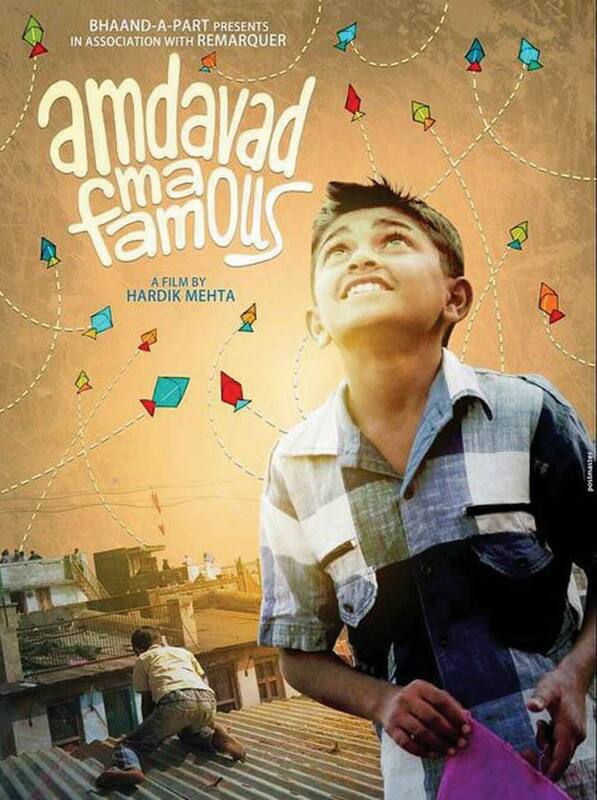 Amdavad Ma Famous is a documentary that explores the madness of kite-flying festival in old Ahmedabad through the eyes of a 11 year old kid Zaid. In a candid chat with Madaboutmoviez, director Hardik Mehta (Script Supervisor for Lootera & Queen) and DOP Piyush Puty (DOP/ co-director for the Making of Lootera) took us through the trials and tribulations of making this film which has won the best non-feature film award at the recently concluded National Film Awards. While submitting the film at the National Awards did it ever cross your mind that you will end up winning it? Hardik: After we won the Mumbai International Film Festival (MIFF) we had an inkling it has come out well. Then after it was selected for Hot Docs we knew we had to send it for sure. Piyush was the one who suggested it first. He felt that we had a chance at Best Cultural or Best Children’s film at least. But Best Non-feature is what none of us had expected. Piyush: It also gives us motivation that we are on the right track and we are not the only ones liking it. Hardik: (Laughs) So I went to old Ahmedabad and was exploring still photography. Having grown up in Baroda, I found the kite flying celebrations in the old city very intriguing. So on 8th or 9th January I found this boy, Zaid, who just loved chasing and collecting Kites. I saw a story there and called up Piyush. The very next morning he was there in Ahmedabad with his camera and sound equipment. Hardik you have also edited the film. Was it more because it was an indie with limited resources or because you felt that way you would do more justice to the film? Hardik: The latter. There is so much footage. A person should understand not only the craft but also the world of the film. He should not be on board just as a technician. Piyush: Since the idea (of the film) came from Hardik, I don’t think someone else, editing it, would have done equal justice. Hardik: Same for Piyush. He is from Odisha. So he has a fresh pair of eyes, which me, being from Gujarat and having witnessed kite festivals from childhood, can’t have. He was so excited he wanted to shoot everything that was happening. His lensing, his framing, gave the film a whole new feel. I am someone who doesn’t like too many camera gimmicks in a movie. But Piyush experiments a lot and still adds to the film. Like there is a whole sequence (which is now the opening scene of the film) where he had the idea of following the kid as he ran after the kite. We were not able to do that with a tele. So he attached a go-pro to the kid and got some more feed through an iPhone. When we showed the first cut to Vikramaditya Motwane, even he said that Piyush had actually done a next level job with the film. Tell us about your individual journeys and how did you two collaborate for the first time. Hardik: I am a graduate in food technology from Anand. Since I did not want to do anything in engineering so I joined an ad agency. While working there I got inspired to make films. So through that agency only I got a chance at a corporate film. That is where Piyush and I collaborated for the first time. Prior to that we had already shared rooms during the Lootera shoot (for which we can’t thank Dipa aunty enough). Post that ad shoot everybody helmed Piyush’s work. Even if you see his frames in the ‘Making of Lootera’, he has maintained the tone and grain of the film throughout the documentary. It is not a typical “making of..” video filled with mundane close-ups. Most importantly, Piyush likes to shoot a lot. Even in this documentary, if you see, we have captured pretty much everything in the half hour running length – from the madness of the festival to the old men to the local food to the old city architecture – we had the entire checklist ticked. How did you find your Zaid? Was there no resistance from boy while filming him? Hardik: The only thing he ever said was “Mere ko patang pakadne se mat roko…” Piyush is extremely good with tele lenses. So we kept on following him, we discovered the story about him climbing upon a terrace illegally to get his kites. He is chased away from there by everyone from the jamadaar to the maulvi. That is when Zaid and his friends started revealing their secrets to us about how they steal into the terrace in the dark of the night when there is no one to keep an eye on them. That helped us find the conflict in this story. We were there only to experience and capture the kite festival in its entirety, but the boy and his adventures of breaking into the terrace discreetly, gave us our story. So you never really had a “script” in your mind. Hardik: In a documentary you only follow a protagonist. Whether a script, a drama.. comes out of it or not doesn’t matter. The screenplay writing in a documentary is editing. You need to be true to the fact. If you edit out anything in between, the whole meaning of certain set of facts change. Also being an AD on a fictional film, your approach to the whole way of directing a documentary changes. You don’t try to explain every minute detail using a voice over. Why has the duration of this documentary been kept so short (30 min). I am sure a longer length would have made theatrical release a bit more convenient. Piyush: Lekin phir wo dedh ghante itne boring hote…. With this film I feel, those who have watched long documentaries will definitely watch it and those who haven’t will also watch it. Hardik: I somewhat agree with you. In fact we also had 70-80 min of material. But then we didn’t want to make a Special 26 wala mistake where a film that should have been only chabbis minute was made into a 2 hour film! Someone had suggested to me during the edit, why didn’t you take a few drone shots. They don’t realise that this is not some high budget Gujarat tourism film. It’s just the story of a little boy who loves chasing the kites. We could have gone into the whole “Muslim boy enjoying a Hindu festival” angle and made it into a socially relevant documentary. But this is just a matter-of-fact documentary. Us patang me uss bachche ki jaan atki hui hai aur usse chhudana uske liye sabse badi baat hai. Piyush: We didn’t want to make mountain out of a mole. We never made it bigger than what it is. This madness is part of people’s lives. They live it. That’s it. It was during our MIFF screening that some academician told me that with this film we have actually changed the approach to making documentaries. While shooting or editing it we never thought that way! Which all festivals has it been already been or will be screened at soon? Hardik: Budapest, Al Jazeera, MIFF, Silk Road, Estonia, Taos Shortz Film Fest (New Mexico), Hot Docs (Toronto), Cronograf (Moldova) and then there is this All Sports Los Angeles Film Festival too. It is an exclusive sports film festival and it would be interesting to have a film on kite flying screened there. One must understand that with each festival there is an additional cost of Fedex, DCP conversions, etc. We were very fortunate to have two great producers in Akanksha Tewari (my wife and our first producer who left her job for this film) and Arya Menon (who instantly joined in after seeing one long off-line cut). I must also mention that good post-production makes or breaks a documentary. So had it not been for Manoj Goswami and Alokananda Dasgupta (Shala, Fandry) who came on board as sound designer and music composer respectively, the film would not have been the same. Aloka was the only composer from India at Berlin Talent Campus this year and her music brought in so much more humor to the film. Have you pitched the film to any distributors yet? Hardik: So with Hot Docs we would be exploring that option now. It has a professional set-up where a group of distributors, film makers and festival programmers meet through an online forum much before the actual fest. There you get to know the profiles of individual distributors, knowledge of acquisition costs in different territories and fix your appointments with them all before the festival has begun. Piyush: For me I am more excited about showing the film in person to all the people who have been asking about it and see their reactions. Hardik: Also now that it has won a National Award it is eligible for a slot on Doordarshan. We will have to shorten it a bit for the 25 minute slot we would be getting. With Doordarshan, I am confident the film will get a wide reach. I also want to explore the various VoD platforms. For example, TVF Play which has a huge following and have been looking for content apart from their own. Finally, any advise for budding documentary film makers? Hardik: India is a land of stories. We were the country that introduced the concept of story telling to the world. Bollywood doesn’t do even 0.1% justice to the stories we have to offer. Documentary is a far more powerful medium than fiction. So with so many options available – Cannon, iPhone – we should start telling these stories on our own and not wait for big productions to come and tell them for us. Good interview, Abhishek! Congratulations to Piyush and Hardik! I hope we get see the film soon. I would only like to know whether the book Kite Runner inspired them in any way for the subject of their film.